A fun episode in which Landmark Home and Land Company president Steve Tuma recalls some interesting building situations the company has helped its customers contend with. Landmark Home and Land Company’s reputation for service is well known. Interviewer: Hey everybody. 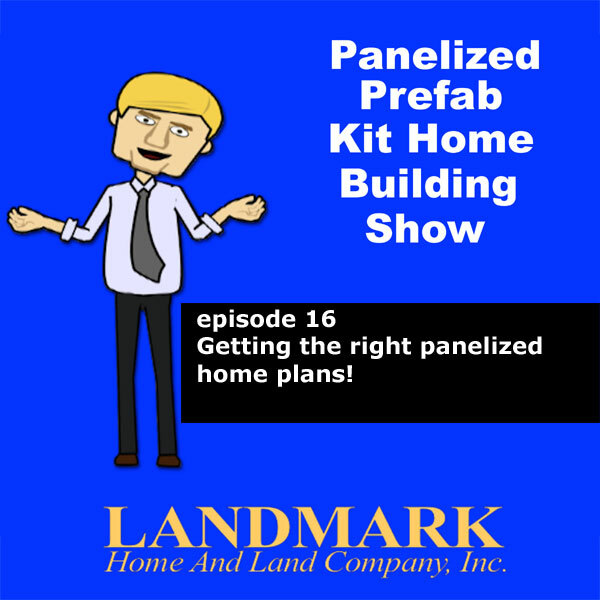 It’s once again time for the Panelized Prefab Kit Home Building Show. Sitting in the studio with me is my co-host, the President and Founder of Landmark Home and Land Company, a company which has been helping people build their new homes where they want exactly as they want across the nation and worldwide since 1993, Mr. Steve Tuma. Steve, what’s up my friend? Steve Landmark: It’s another great day. Good to talk more about panelized homes. Interviewer: Yours and my favorite subject. Steve Landmark: Yeah, it’s – well, it’s an interesting process. All of us live some place. So it’s kind of neat to have an understanding of an option that’s out there to help people design and build a house that they actually like and enjoy. Interviewer: Well, we’ve been spending a lot of episodes going over just the basic construct and conception of what panelized home building really is and what the processes are and also we’ve been covering a lot of questions from customers and potential customers, which has been great. But I was thinking I might like to get in a talk today about some of the more interesting situations you’ve come across while helping people build their new homes. I’m sure there have been plenty of unique challenges along the way in your company’s 25-year history. I’m sure that there are – where there are probably – for every 100 customers, that everything goes pretty smooth. You’ve probably had a couple where the customer runs into some problems with their particular area, dealing with permits and such. But does anything strike you off the top of your head right now about the unique situations lately that you’ve run into? Steve Landmark: Well, the key thing is people’s understanding of what’s required for a good set of plans. It’s kind of interesting. As technology progresses, you can jump online and draw your own set of plans. You can buy a simple little program and draw them that way. You can hand sketch them. You can go buy a standardized set of plans and what people don’t realize is the quality of plans can vary considerably. Not all set of plans are the same. So just because your friend won an award in high school doesn’t mean he knows how to draw a set of plans. It’s possible they may work. But most likely, there are a lot of details, especially in the more sophisticated areas where the plans need to be detailed properly. So what we suggest to people is get an idea of the concept of what they want to build and then have us develop the plans because like you take for example standardized plans. They’re typically built for one portion of the country, under a certain code that may or may not apply for what your building department chooses to enforce. I worked with a designer and I told them I wanted to spend 350,000 on a house. I got a budget of 700. Well, they just helped that designer develop his portfolio. But he didn’t make sure that they would get the house built. We look at the process of let’s help the customer get the house built, not just draw a bunch of dream ideas that never will have the concept of being built, but also to make sure the codes work. Make sure the energy codes work. Make sure the electrical layouts are proper. Make sure the HVAC design is proper. Make sure the foundation design is proper for the site and the soil conditions. There’s a lot of elements there which generally standardize plans and not all designers understand. There’s a difference of saying, “Hey, I had this guy draw these plans up. He’s my friend. He has done it. It was a couple of hundred bucks,” compared to making sure that the plans were done properly and that are actually usable. So it’s kind of one of these situations. You can save a penny now and it will cost you a dollar later. You’re better off spending a fair price to get the plans done properly for your lot. It will save you money and headache in the long run. So that’s the key thing is proper planning upfront and we’re fully capable of helping and we could do it nationwide and international as well. Interviewer: Now I had a friend of mine, a young woman who inherited some land up in Idaho and there was a great barn on it. The only structure really on it was an older double-wide mobile home. She was talking about building and I had turned her on to your website, to the Landmark website. She said, “You know, it just seems a little overwhelming to me,” and I said, “No. Really if you get to the right people who have the right answers for you, that they can talk you through it. It may be easier than you think.” Do you ever find you have a lot of customers who contact you, who just say, “I don’t have a clue where to get started”? Steve Landmark: Yes. In some cases, that happens. In other cases, there are different levels of that. So the people might have an idea. They know how to get started but they may not have done it or maybe they’ve done it once or twice. But the idea is they know they’re at step A. They want to build a house. Z is move into the house. So they know that there’s a design. They know that they have to dig a hole for the foundation. They know they have to pour a foundation. They know they have to frame the house. They know they have to get an electrician and plumber. But filling in all those gaps of how do you do that effectively is the key. Basically I think what you’re asking is how do we make the learning curve shorter. Interviewer: Well, it can seem a little overwhelming even to somebody, even if you’re going to your website and you’ve got all the answers there. Even a lot of answers can seem overwhelming. Steve Landmark: Well, it’s true because your friend in Idaho has a different situation than if she decided to build the same house in South Florida with hurricanes or if she decided to build in Southern California with earthquakes or anywhere in California actually. So that’s the point is none of us are born knowing everything. We would like to think that. But the reality is, is it’s kind of unchartered territory and that’s where we come in with the customer support, the proper set of plans and the knowledge to help someone, is to fill in those gaps. So when someone says, “Hey, I don’t know where to start,” we can develop a general timeline and say, “Hey, let’s get a set of plans going.” You know, first of all, what do you want to build? Oh, I want a 1200-square-foot ranch with a two-car garage. I’m into horses in Idaho. I would like a little tack room in the back of my house. So we could design a house like that. Then once the architectural design processes are put together, we can then go through and develop the final set of plans for permits. Now that’s a simplification and it is simpler for them because we are doing all the behind-the-scenes work. They don’t have to know the size of a window. They don’t have to know the exact size of a door or kitchen cabinet. They don’t have to know the size, the span of a two-by-ten or two-by-twelve or an I-joist or floor joist. We can go through and get them that end result. So they could say, “Hey, I want to have a basement. But I don’t want any posts or I want to minimize the posts.” We could then review with them the different options of floor systems to minimize beams and posts, so that their basement is more usable. That I think is what you’re getting at is we could fill in the gaps, where they need the help and help them completely through the process. That’s extremely important because you can buy wood in a lot of places. Someone will sell you a set of plans. But how do you know that it will go together? Who do you call if you have questions? That’s what we’re able to do is be supportive, responsive and help the customer get to the end result of turning that key into their brand new home. Interviewer: Are you usually able on a first phone call to kind of assess where the home buyer’s experience is and kind of what you’re going to need to do to help them achieve their goals? Interviewer: There’s something we’ve hit upon in the past and I’m bringing it up again now because we’re talking about people who – you know, some people who don’t have the experience or the knowledge and when it comes to dealing with things like – let’s say a building department, a very challenging building department in a certain area. I know just from working with you on this show, that they’re quite different from region to region. How far and how wide can Landmark go to help you get through those difficult requirements that some building departments are looking for? Well, we’ve probably experienced it before. So someone that may not have the experience would think it’s tricky to us. It’s just part of what we do every day. We work with those. We have the proper architectural designers. We have the structural engineers, green code people, energy code people, HVAC design, electrical engineers, plumbing engineers, foundation engineers. We’ve got the team of people to get this put together and we have an understanding of the codes. So the concept of moving forward isn’t bad. Now sometimes what happens is there’s a selective enforcement or different interpretation of a code. You know, it’s – and it’s not just building department by building department. It could be an inspector within that building department. They can each have different opinions on how to go through and take care of an issue and that’s fine. A couple of times a year, we will get requests from building departments that we’ve never heard of anywhere. It’s not necessarily a code issue. The inspector says, “Hey, this makes sense.” At a certain point, let’s just get them the information. Make sure the plans are right. Go through. Get it built and then your house is – it’s a good home. So we’ve never been stumped by a building department. There have been some curveballs. But we get through them. We take care of it and every customer supplied has ended up with a permit. We’re pretty good at taking care of this. Oh, one other thing I want to bring up. We do work nationwide. A lot of people think, “Well, I got to have an engineer in my town,” because for some reason they think that the knowledge of the code in that town is restricted to the geography of that town. It’s not true. It’s a nationwide code. It’s the enforcement within a specific community that’s different. But it’s not limited to the geographic area. So because you’re building in Miami, Florida doesn’t mean your engineer has to like have lived there or grown up there, gone to school there. It’s that you have to understand the situation. A lot of people don’t understand it. They think there’s some geographic limitation of knowledge and there isn’t. It’s a national code and it’s the application of the code to your building site that’s important. So if you go take a particular code and put it in Florida, like say Key West, it’s going to be a storm surge and high speed winds because of the hurricanes. That same code will cover Leadville, Colorado, the highest populated city in America with high winds and the snow loads and possible expansive soils. Then again let’s jump over to Los Angeles. That exact same code will have a different application for earthquakes. So it’s the understanding of the code and how it applies to your situation. So, let’s just take Los Angeles. There are mountains. There are flat areas. In Southern California, there are mountains. There are areas that are closer to fault lines. There are snow loads. There’s expansive soils. They can all be in the same geographic area. So it’s the understanding of the application of that code for your particular house and that exact piece of land. That I think is where we really shine because we have an understanding of it from all the exposure we’ve had to projects all over the country. Interviewer: Well, let’s face it. With the internet, it’s such a wide and wonderful world. But there’s also a lot of misinformation out there and I’m sure you must be dealing with people who get a lot of information that’s wrong off the internet and then come to you with answers on how you can fix certain – basically to boil it down, you guys must do a lot of work just getting the customer to understand their own building project, after all that has been – their head has been kind of imploding with information that they’re getting out there. Steve Landmark: Well, we do help people if they’ve got a – you know, they’ve got their friend. They’ve got someone else. They’ve got this. They’ve got a TV show. I joke about the internet PhD. You can read so many articles and opinions that some people can think that they have a knowledge. The reality is, is we work with them to develop that plan that actually makes sense. Sometimes it’s not that it’s misinformation. It’s that the person you’re listening to built under a different condition or they built 20 years ago. So you go look at the codes, like I talked about in Florida and the hurricanes. The code 20 years ago was different. So when someone says, “Well, when I built it, I didn’t have to have holdouts. I didn’t have to put my house on piers. I didn’t have to worry about storm surge.” Well, 20, 30 years ago, there weren’t a lot of the tight codes that we had today. So it’s not that they’re misrepresenting. They just don’t realize that the world has progressed and we have a better understanding of snow loads, earthquakes, hurricanes, storm surges and details like that. So it’s working with the person so that they understand it. We don’t want to just say, “Hey, this is the way it is.” But so that our customer has an understanding of why what they’re doing makes sense and needs to be done. The code isn’t just there saying, “Hey, let’s do this. We want to make your house more expensive.” The code is saying, “Hey, let’s do it, so your house is safe.” So your family is safe. So the value of your home is retained, so the value of your community is retained. So I’m not always a fan of all these different codes and everything. But the reality is, this stuff is put together for the safety and the longevity of your home. So yes, we are able to work with people, so that they get a better grasp of how to build their home properly. So when someone comes through and say, “Hey, I’ve been in this area. We haven’t had an earthquake forever,” or “Hey, we haven’t had a hurricane,” we can talk about different situations as to why it makes sense to properly design your home and engineer it or if people say, “Hey, energy is not expensive in my community. Why do I have to worry about energy codes?” Well, sometimes it’s not just the cost. It’s the comfort of the home. Steve Landmark: And it’s retaining the value and knowing that you have a well-designed home. So it’s kind of neat. We develop an interesting relationship with people. We’re not just trying to say, “Hey, here’s a panelized home. We’re the best on earth.” We’re trying to say, “Let’s work together so you understand why you are getting the best home, why it makes sense to do this,” because sometimes people know what they know, but they don’t know what they don’t know. So when you’re able to have a communication and say, “Hey, let’s put these bigger overhangs on your house,” that will restrict the light coming into your living room in summer, making it more comfortable and your air conditioner having to work less. Suddenly people are like, “You know what? That makes sense.” To extend an overhang in a house is relatively little cost. But if it makes it more energy-efficient, more comfortable and my bills are less, the financial return on a simple design element like that is huge. Steve Landmark: It’s also a lot of fun. There’s a lot of details. People just have a natural tendency to kind of like and want to know about where they want to live. We’re getting a lot more people that have craft rooms, gaming rooms, man caves, workshops. You know, different – convertible rooms. You know, the empty nesters or the younger people with their first house. They need a house that’s kind of like – or sorry, a room that’s kind of like a guest room, but home office type thing. So just understanding what the customer needs and putting these details together is pretty interesting to make sure that they enjoy the house that they’re building. Interviewer: Yeah, that’s kind of an important deal. Steve Landmark: That’s the point. Interviewer: Well, once again we’ve come to the end of another great show. But before we head out, Steve, tell our listeners the best way to get information and how to contact Landmark Home and Land Company. Steve Landmark: Well, the best way to get in touch with us is to just check out our website at www.LHLC.com. That’s just the initials of Landmark Home Land Company, so www.LHLC.com. You can also give us a call at 800-830-9788 or you can send an email to Mike at mike@lhlc.com or send an email to me at landmark@lhlc.com and we will take care of you right away. We will get you an answer. We will acknowledge your communication to us and do what we can to help you make the project happen. Interviewer: Awesome! That wraps it up for another episode for the Panelized Prefab Kit Home Building Show. So for Landmark Home and Land Company President Steve Tuma and myself, thanks for listening and we will see you next time.